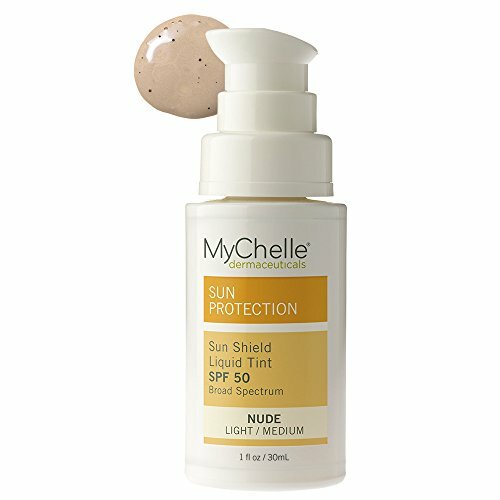 MyChelle Sun Shield Liquid Tint SPF 50 is a softly tinted, 100% mineral sun screen for maximum UVA/UVB broad-spectrum protection. This silky, sheer formula blends weightlessly and seamlessly, matching your skin tone, giving skin a fresh, healthy glow. Contains Bentonite Clay to absorb excess oil and impurities from pores. Wear alone for a natural look or use as a primer under foundation to create a smooth, matte finish. Oil-free and recommended for all skin types. Shake well. For daily use, allow product to absorb completely before applying make-up. Apply liberally and evenly 15 minutes before sun exposure. Reapply after swimming or sweating and at least every 2 hours. For body and face. Vegan; reef safe; biodegradable; made without GMO, Gluten, Parabens, Petroleum, Phthalates, Silicones, Sulfates, Urea's, Artificial Fragrances, and Artificial Colors. If you have any questions about this product by MyChelle Dermaceuticals, contact us by completing and submitting the form below. If you are looking for a specif part number, please include it with your message. Norvell Professional Sunless Self-Tanning Mist - Airbrush Spray Solution with Bronzer for Instant Sun Kissed Glow, 7 fl.oz.